One of the main intents of an initial mold inspection is to identify whether or not you have a mold problem. This can obviously lead to one of two outcomes: 1) You do not have a mold problem and your concerns were alleviated through a thorough mold inspection and/or testing, or 2) You do have a mold problem and proper mold remediation should be performed. I don’t know about you, but I would be hoping for option one. But, unfortunately, a lot of people end up in situation number two. The next step to properly address the situation is to enlist a certified, competent remediation contractor to perform mold remediation (removal of mold) in the affected area. This can be a pretty in depth process, but for the sake of this article (and the next two to follow) we shall break it down into three basic steps. When a remediation project is initiated, the first step is to set up containment (isolation) of the affected area. One of the concerns when indoor mold is present is the resulting airborne mold spores. Containment will help control the spread of these spores, while assisting the remediation contractor in returning the affected area to normal conditions. The act of removing or disturbing a mold source tends to distribute large quantities of mold spores into the air. If proper containment is not utilized, this can affect adjacent spaces to the work area and cause cross contamination. The first step to setting up containment of the work area is installing a HEPA Filtered Negative Air machine. This is a fan that is set within the work area which pulls air from the area which is typically exhausted outside of the structure via flexible tubing or ducting. Doing this will begin to draw any airborne mold spores away from the airspace eventually creating a negative pressure environment, which we will be discuss later in this article. Step two is to install physical barriers in the work area. This is most typically done with the use of heavy plastic. The main goal when creating this physical barrier is to completely isolate the work area from any adjacent, non-affected areas. For example, if mold is present in one room of your home and the adjacent areas have not been affected, the room must be isolated. Depending on the layout, the doorway would be completely sealed with plastic. 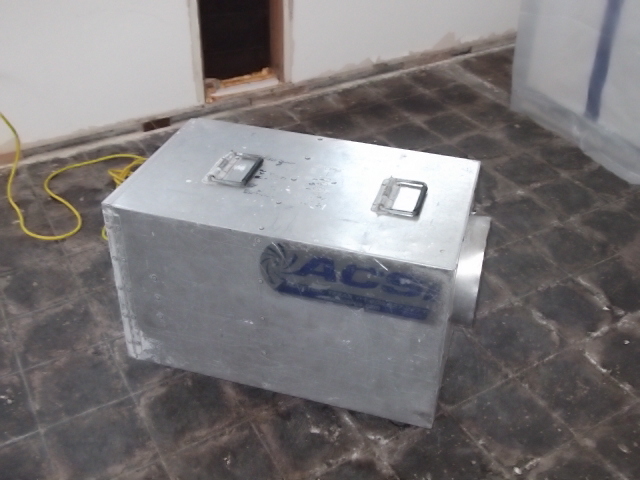 All HVAC systems or shared airways between other rooms would be taped or covered in plastic. All electrical outlets and light fixtures would be covered. In essence, any area that could allow air communication between the work area and other non-affected areas should be properly sealed. Once step one and two are completed, a negative pressure environment should be created. A negative pressure environment simply means that the air pressure within the work space is less than the air pressure in the areas surrounding that space. This is achieved when the volume of air being pulled out of the space (through the negative air machine) is greater than the volume of air being pulled into the space. 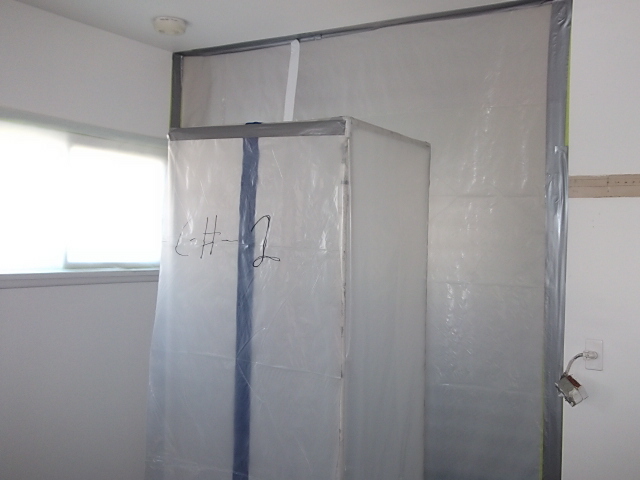 As a result of this negative air pressure within the work space, any mold spores that become airborne through the remediation efforts are being controlled, preventing them from affecting the adjacent spaces and flushing them away from the indoor environment which is necessary when attempting to return the area to normal conditions.